The Recording Industry Association of America (RIAA) recently published the shipment figures for recorded music in the US for 2016. 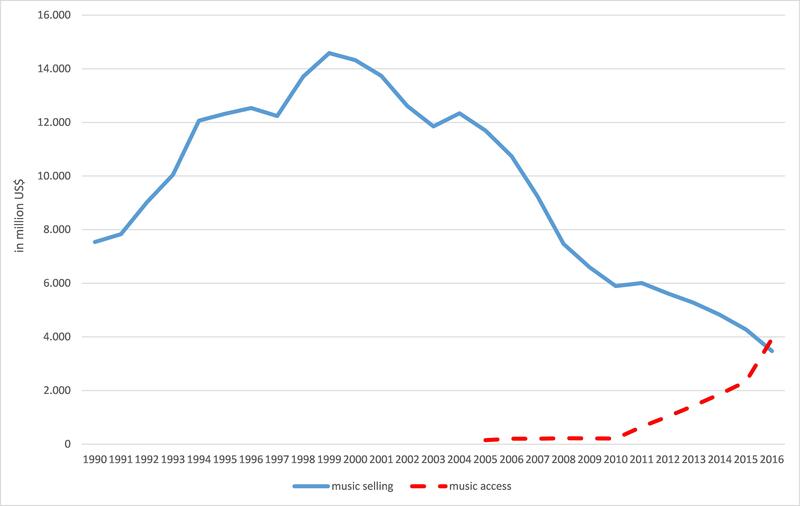 The statistics highlight a tremendous shift from selling music (CDs and downloads) to accessing music (by streaming services). In the US, music consumers paid for the first time more for music access by ad-supported and paid streaming services (US$ 3.9bn) than for CDs, music downloads and ringtones (US$ 3.5bn). Thus, the US turned into a music streaming economy last year. It was a long way from a pure physical recorded music market in the 1990s to a yet digitized and music streaming driven market. The following blog entry identifies different periods of the US phonographic market and explains the driving forces of the change.